Just in time for Valentines Day! 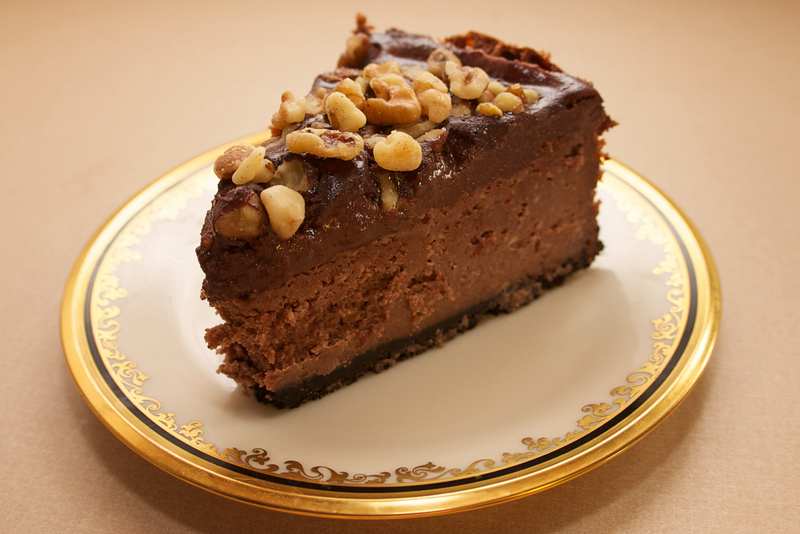 Chocolate decadence for you and your honey. Crust: Heat oven to 350 degrees F. In a small mixing bowl, combine crust ingredients. Pat into the bottom of 9 inch springform pan and bake for 10 minutes. Filling: In a mixer bowl, beat cream cheese, sugar, flour and vanilla extract until just combined. Add egg yolks and egg, beat on low until just combined. Do not beat on high or you’ll get too much air in it. Add milk and Nutella and mix completely. Pour filling into springform pan. Reduce oven temperature to 300 degrees F. Place springform pan on a cookie sheet and place in oven. Bake for about 1 1/2 hours, or until center appears set when shaken lightly. I cooked mine for 95 minutes. It will jiggle slightly like jello but should not slosh around. Remove and cool completely on a wire rack. Topping: Bring cream to a boil. Pour over chocolate chips. Stir until smooth. Spread evenly over top of cheesecake. 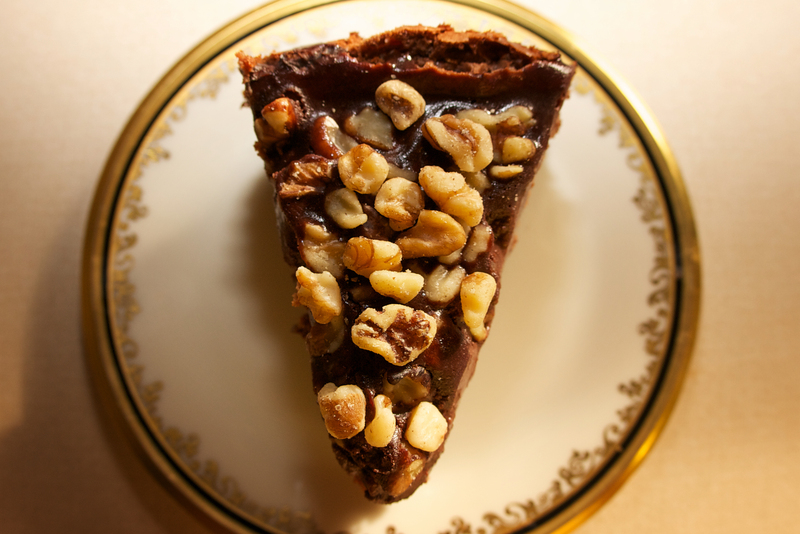 Sprinkle chopped walnuts over chocolate. Refrigerate cheesecake for at least 4 hours (even better overnight) to set. Bakers notes: It has come to my attention that some springform pan seals are not as tight as mine. If you have a springform pan that doesn’t seal well, please make sure you bake the crust with a cookie sheet underneath. 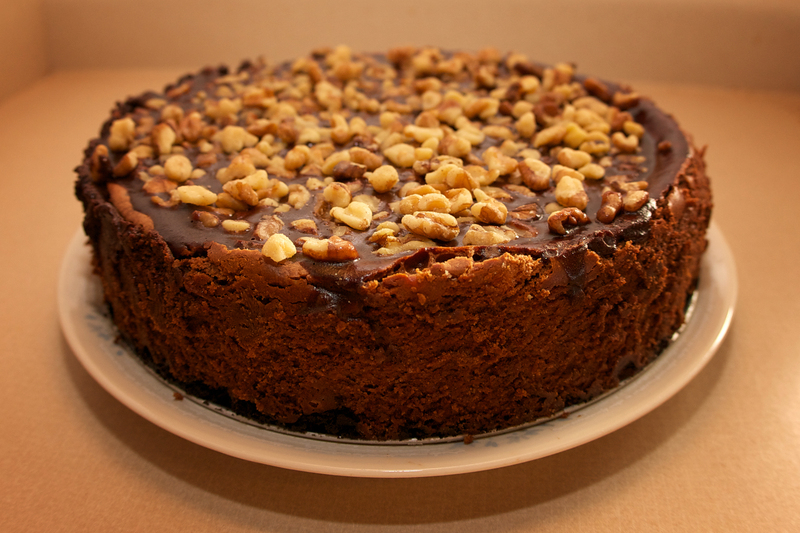 This entry was posted in Uncategorized and tagged cheesecake, Nutella, Nutella cheesecake. Bookmark the permalink. Will mine be arriving by FedEx or UPS tomorrow? I second that. Are you taking orders? OMG! I think I gained 5 lbs. just looking at the pictures. Enjoy Fernando! Death by Chocolate. That looks so good.